There sat the Joc Pederson and Max Muncy of the Los Angeles Dodgers, the duo at a postgame interview table after helping propel the Los Angeles Dodgers to a 6-0 victory over the Atlanta Braves on Thursday in Game 1 of the National League Division Series and in their preferred style — blast. Pederson — who set a Dodgers record with eight home runs to lead off a game this year — blasted a leadoff home run. An inning later Muncy — who had a team-high 35 home runs this season — blasted a three-run homer. And together they blasted away most of the controversy stirred up when the Dodgers selected Hyun-jin Ryu over Clayton Kershaw to start Game 1. Ryu was brilliant, allowing only four base hits, striking out eight and walking none in seven innings. But it’s a heckuva lot easier to pitch pitch when Pederson, Muncy and the rest of this Dodger blue wrecking crew is blasting away. Kiki Hernandez hit a solo home in the sixth, for good measure, and so on the night it was three more dingers for a team that loves them. During the regular season, the Dodgers set a franchise single-season record with 235 home runs. And the power couple — Pederson, the Dodgers’ left fielder, and Muncy, the Dodgers’ first baseman — looked good against softballs (questions, that is) too. How is it that eight of Pederson’s 25 home runs — 32 percent — have come on a game’s first at-bat? No one is going to mention these guys in the same sentence as Babe Ruth, until someone did just that. 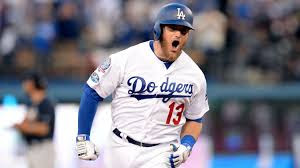 In the interview room, a reporter said that Muncy was the second player in postseason history to go 1-for-1 with three or more walks since Babe Ruth did the same thing during the 1926 World Series. How many times has Muncy been compared to the Babe? But perhaps in time they’ll be calling these Dodgers the Bronx Bombers of the West. At the end of the regular season, after all, the Dodgers’ home run total trailed only that of the New York Yankees, who hit a franchise record 267 home runs. It’s worth noting that last year’s World Series champions, the Houston Astros, finished the 2017 regular season second in the major leagues in home runs. The Astros also had great pitching, as do the Dodgers, and the Dodgers’ power couple indicated they might have something else valuable, too. Muncy said he, Pederson and the others are ready to come off the bench, if needed.